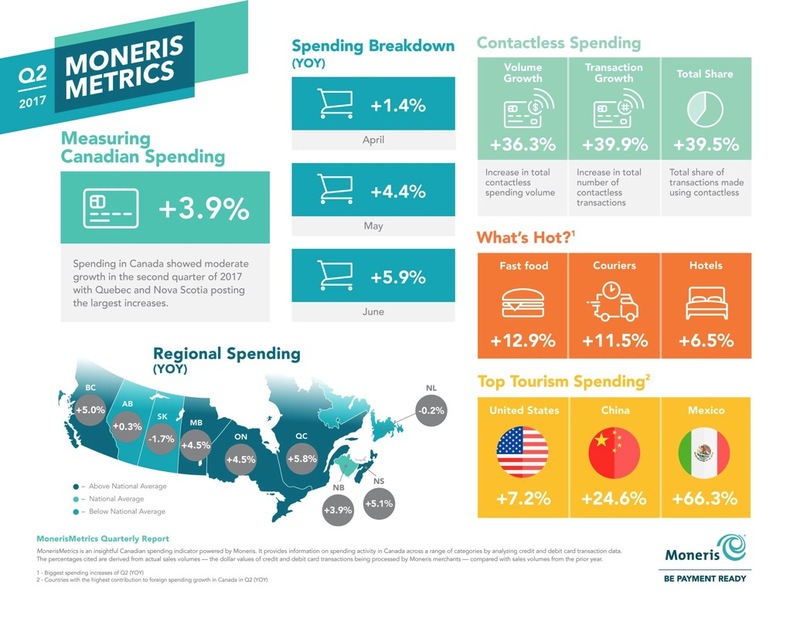 Credit card payment processor Moneris has released their MonerisMetrics report for Q2 spending by Canadians in 2017. According to the company, spending in Canada saw moderate growth of 3.9%, BC, Manitoba, Ontario, Quebec and Nova Scotia spending above the national average, seeing year-over-year growth rates of at least 4.5% or higher. When it comes to contactless payments, Moneris noted Q2 saw the launch of Android Pay in Canada, plus the one year anniversary of the full launch of Apple Pay in the country, which helped boost total contactless dollar volume by 36.29% year-over-year. Despite the contactless dollar volume growth in Q2, Moneris notes the increase was not as high compared to a year ago, when total contactless dollar volume surged by 162.5% year-over-year, suggesting contactless payment options may be hitting a maturity point. When it comes to contactless payment transactions, Q2 saw 39.5% of all transactions made with tap-and-pay, a jump of nearly 31% compared to the year-ago quarter. By the end of 2017, Moneris predicts contactless payments will comprise of nearly 50% of all transactions.